This question is not answered yet satisfactorily – Mrs. Ples was he or she !!. You must be wondering – if name is Mrs. Ples then Mrs. Ples should be married lady. Wait, wait, don’t make any definitive conclusion on this. The name Mrs. Ples itself is a misnomer. This is a story of our human evolution. Story of a human who died in his/her young age or middle age . We don’t have any conclusive answer on that. Nevertheless, let us delve into history to know more about Mrs. Ples. 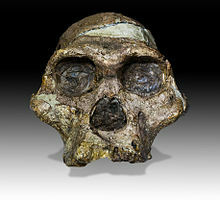 Mrs Ples” was an Australopithecus africanus that lived more than 2-million years ago in the Cradle of Humankind or you can say it is nickname for the most complete skull of an Australopithecus africanus ever found in South Africa. In 1947, Robert Broom was able to find a complete skull – missing only one teeth, while blasting limestone through dynamite in a cave. As per Mr. Robert Broom – the skull represented a female,based on the small size of the sockets for the canine teeth. “Mrs Ples” could walk upright and had a small brain( About 485 cc). Dr Francis Thackeray argued that “Mrs Ples” is the fossil of a young male. She is still going through “IDENTITY CRISIS“. A reconstruction of the fossil Sts 5, better known as ‘Mrs Ples’. Photo courtesy of Mary Harrsch.